Lanes may be located immediately at the curb or in an offset configuration, replacing the rightmost travel lane on a street where parking is permitted. 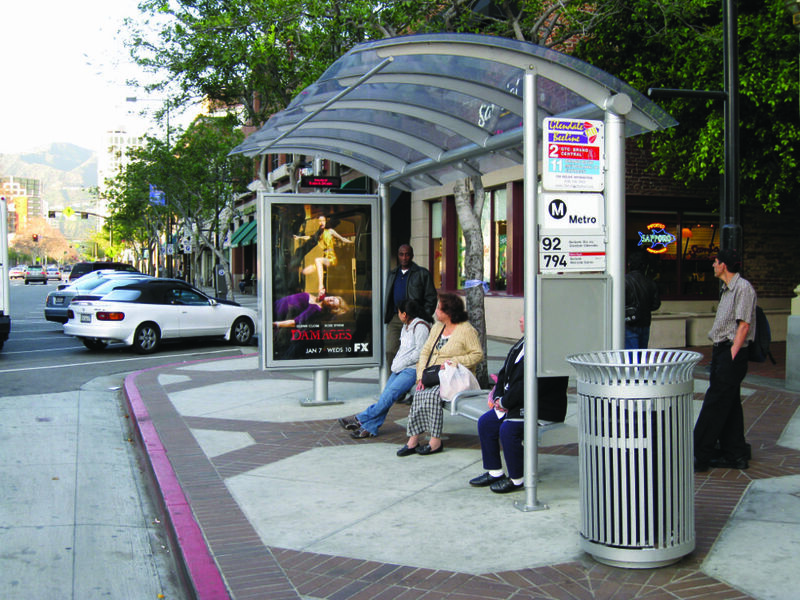 Bus lanes may have complementary effects with other bus rapid transit elements, such as off-board fare payment and transit signal priority. 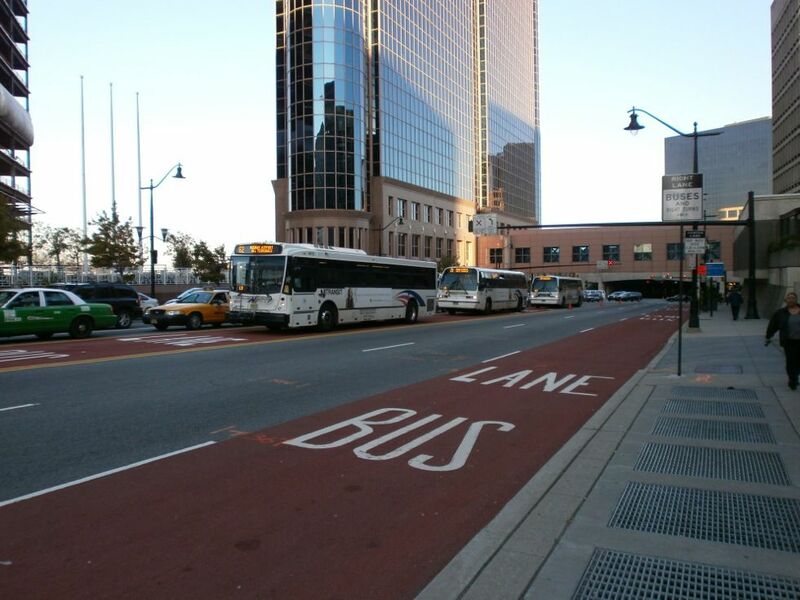 Bus lanes reduce delays due to traffic congestion and help raise the visibility of the high-quality service. 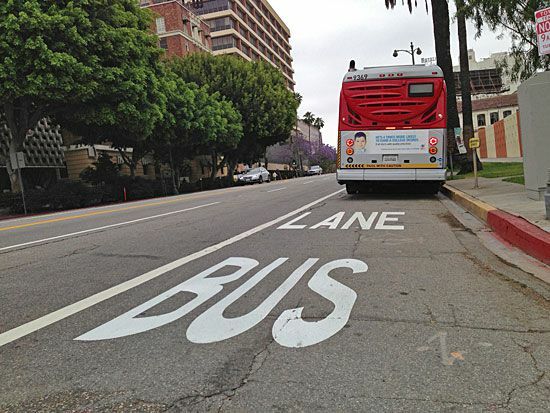 1 BUS ONLY pavement markings should be applied to emphasize the lane and to deter drivers from using it (MUTCD 3D-01). 2 Dedicated lanes should be separated from other traffic using solid single or double white stripes. Bus lane width should be determined based on the available street space and the competing needs of bicyclists, pedestrians, and motorists. 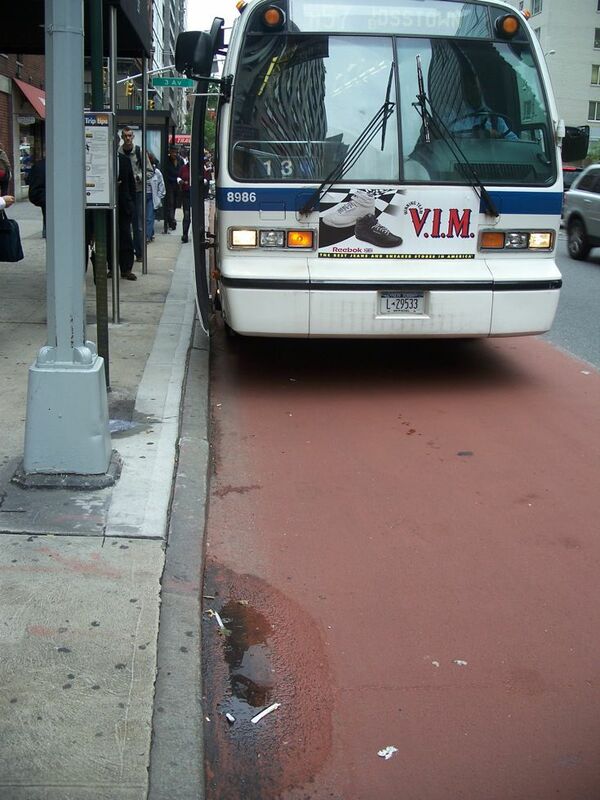 The minimum width of a curbside bus lane is 11 feet. 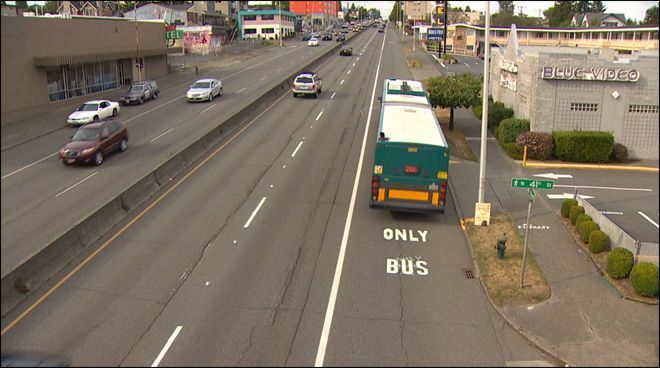 The minimum width of an offset bus lane is 10 feet. 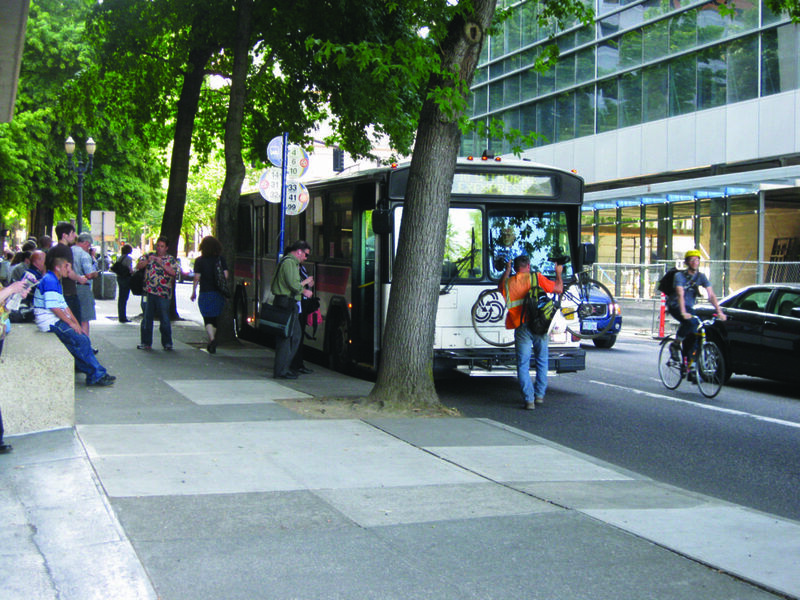 Depending on the configuration of the adjacent sidewalk, including existing pedestrian volumes and the width of the buffer zone, cities may want to consider a wider curbside bus lane. 3 Bus bulbs should be installed if lanes are offset. Bus lanes may have complementary effects with other bus rapid transit elements, such as off-board fare payment and transit signal priority. Transit signal priority should be implemented wherever feasible to reduce transit delays due to traffic signals. Shorter signal cycles also process movements more efficiently and maximize the usefulness of the transit signal priority system. For more information, see William Carry et al., “Red Bus Lane Treatment Evaluation,” Institute for Transportation Engineers (Washington D.C.: 2012). Prohibiting right turns during hours when the dedicated lane is in effect or otherwise separating these movements helps to keep the lane clear. Bus lanes may be separated with soft barriers (i.e. rumble strips) or hard barriers (concrete curbs). If hard separation is used, bus lanes should be designed to allow passing at selected points. Dedicated bus lanes may be implemented on a 24-hour basis or managed for specific intervals of the day only. King County Metro is implementing bus only lanes on a portion of Route 120, one of its top 10 busiest routes with 7,000 daily boardings. “Improving Route 120,” Metro Transit, accessed May 30, 2013. VTA in Vallejo, CA adopted service design guidelines with metrics such as boardings per revenue hour to transition local bus to BRT. Bus Rapid Transit Service Design Guidelines (San Jose: Santa Clara Valley Transportation Authority, 2007). 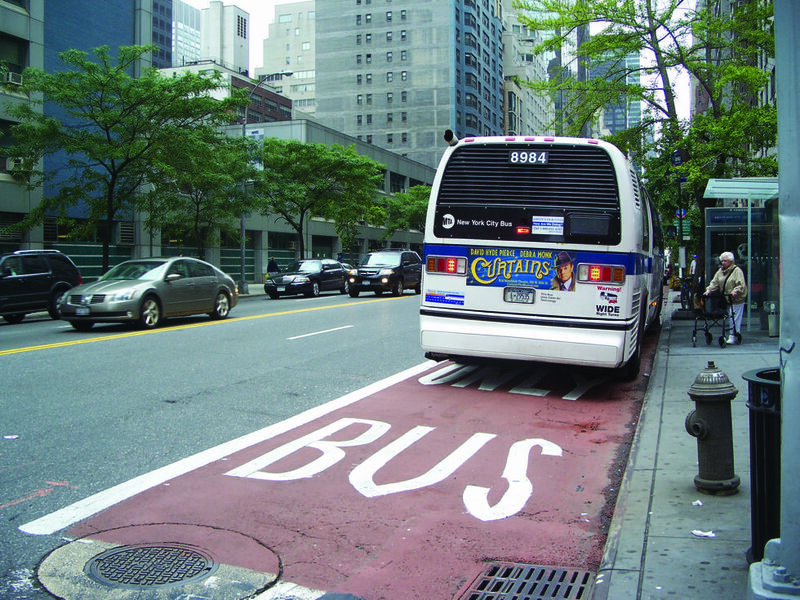 The New York City Department of Transportation, in partnership with New York City Transit (NYCT), the Metropolitan Transportation Authority and City Council members, successfully lobbied the state for legislation allowing installation of bus lane enforcement cameras as part of the new Select Bus Service (SBS), which has red-painted bus only lanes. The SBS system uses two types of cameras. 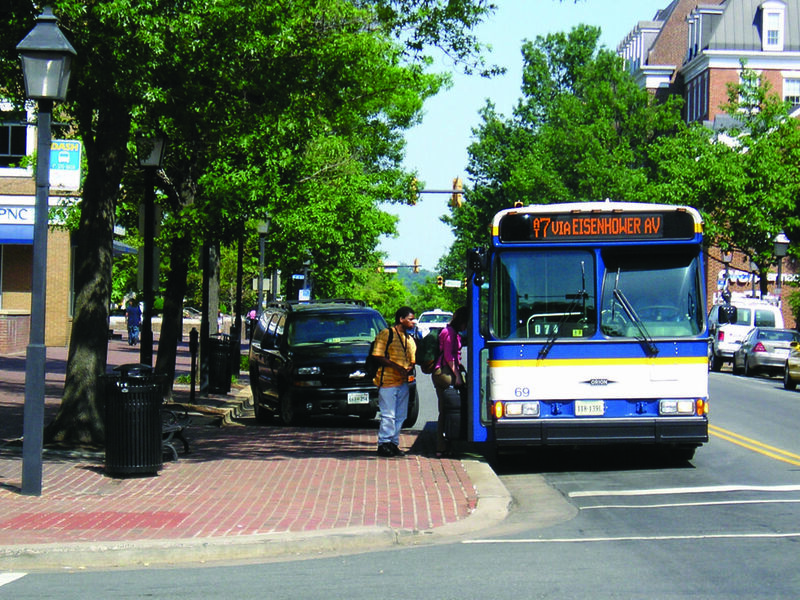 Fixed video cameras were installed on two routes beginning in November 2010. NYC DOT watches the footage and reports violations. 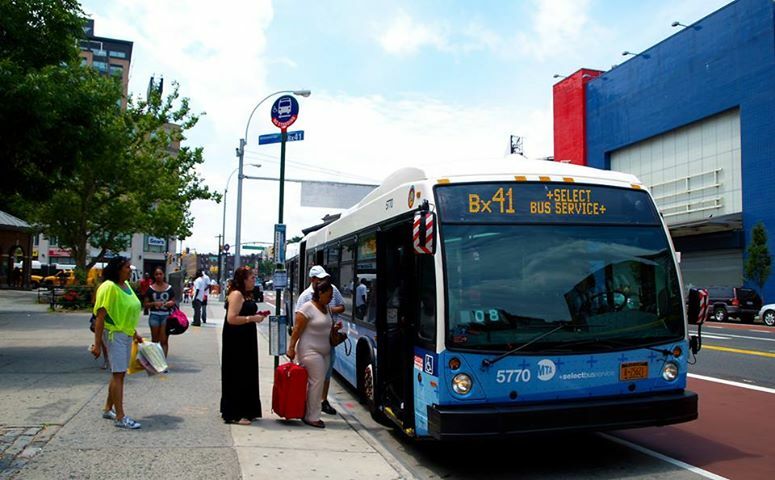 Currently, NYCT is piloting cameras mounted on buses that take photos. Since SBS vehicles run on very short headways of 3–4 minutes, thus if a vehicle shows up on the two consecutive vehicles’ cameras, a violation is recorded. William Carry et al., “Red Bus Lane Treatment Evaluation,” Institute for Transportation Engineers (Washington D.C.: 2012). Agrawal, Asha Weinstein, Todd Goldman, and Nancy Hannaford. 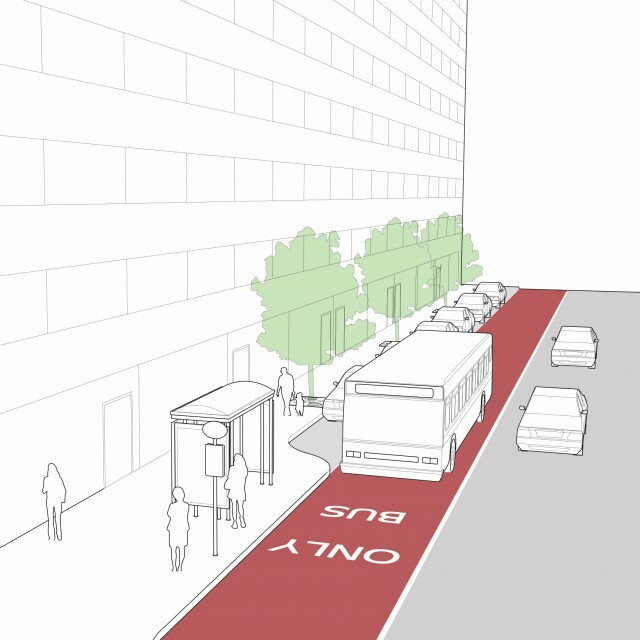 "Shared-Use Bus Priority Lanes on City Streets: Case Studies in Design and Management." Prepared for the Transportation Research Board 91st Annual Meeting, Washington, D.C., January 22-26, 2012. Beaton, Eric B., Evan Bialostozky, Oliver Ernhofer, Theodore V. Orosz, Taylor Reiss, and Donald Yuratovac. 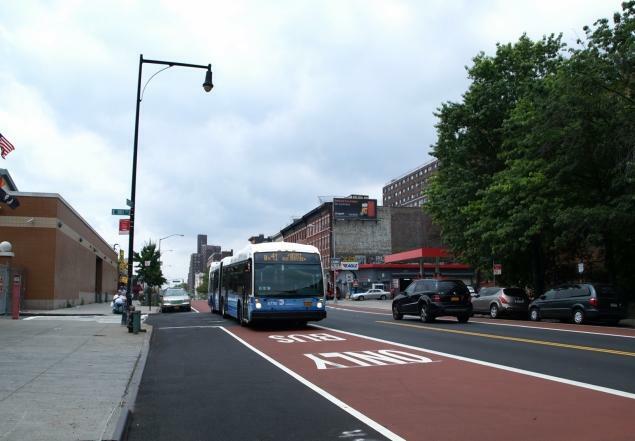 "Designing Bus Rapid Transit Facilities for Constrained Urban Arterials: A case study of the Webster Avenue BRT running way design selection process 2." Paper prepared for the 2013 Transportation Planning Board Annual Meeting, Washington, D.C., January 13-17, 2013. Carry, William, Eric Donnell, Zoltan Rado, Martin Hartman, and Steven Scalici. "Red Bus Lane Treatment Evaluation." Presented at the 2012 ITE Technical Conference and Exhibit, Pasadena, California, March 4-7, 2012. Eichler, Michael, and Carlos F. Daganzo. 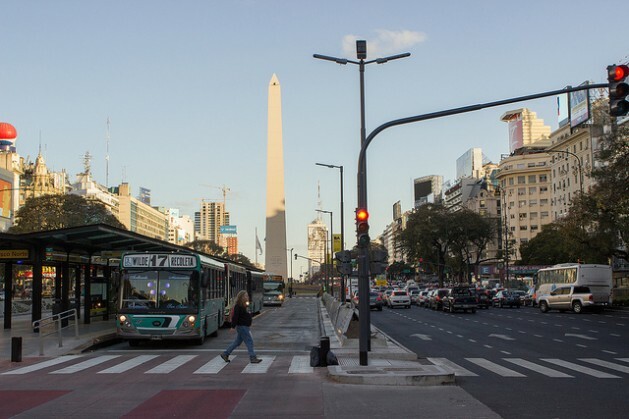 "Bus Lanes with Intermittent Priority: Screening Formulae and an Evaluation." Berkeley: UC Berkeley Center for Future Urban Transport: A Volvo Center for Excellence, Institute of Transportation Studies (UCB), UC Berkeley, 2005. Eichler, Michael David. 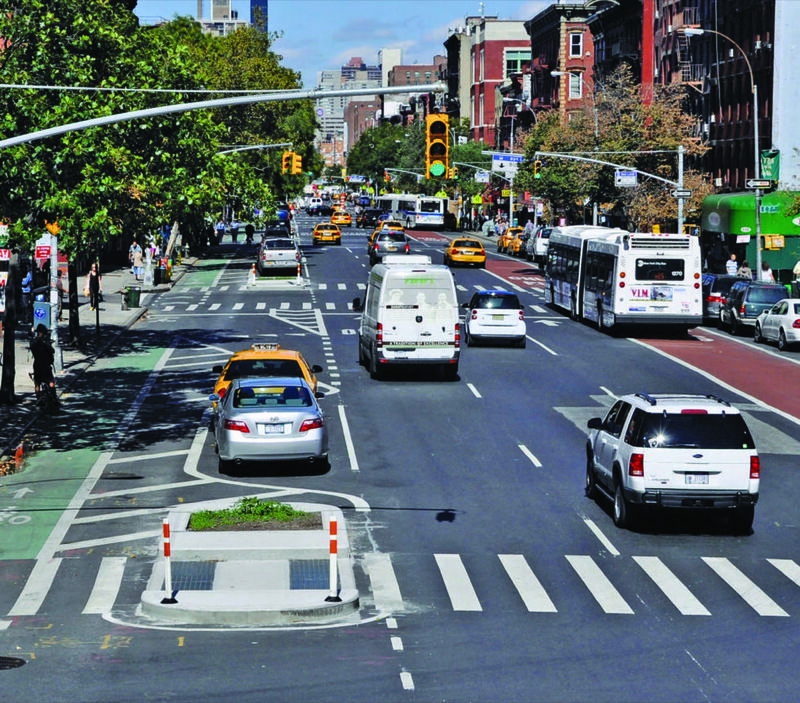 "Bus Lanes with Intermittent Priority: Assessment and Design." Berkeley: City and Regional Planning, University of California, Berkeley, 2005. Fenno, David, Samir Goel, and Paul Schrader. “Managed Lanes-Traffic Modeling.” Texas: Texas Transportation Institute, Texas A&M University System, 2002. Hillsman, Edward L., Sara J. Hendricks, and JoAnne Fiebe. 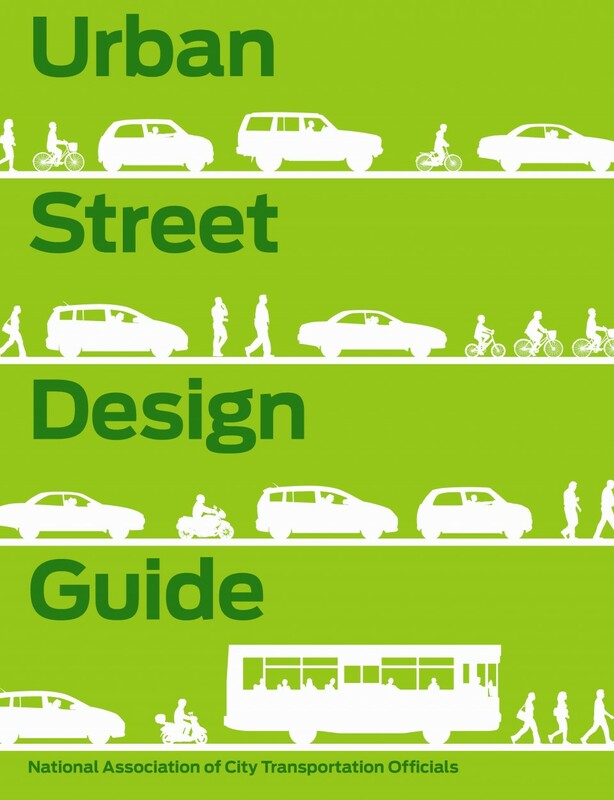 "A Summary of Design, Policies and Operational Characteristics for Shared Bicycle/Bus Lanes." Tampa: Center for Urban Transportation Resarch, University of South Florida, 2012. Jiang, Shan, Han Xue, and Zhi-xiang Li. "Measuring and Evaluation on Priority Lanes." International Journal of Intelligent Systems and Applications (IJISA) (2010): 2(2), 56-63. Kiesling, Michael, and Matthew Ridgway. "Effective Bus Only Lanes." ITE Journal (2006): 76(7), 1-12. King County Metro Transit. “Improving Route 120.” Accessed May 30, 2013. National Capital Region Transportation Planning Board, and Metropolitan Washington Council of Governments. Bus Priority Treatment Guidelines. Washington D.C.: 2011. New York City Department of Transportation. Red Bus Lane Treatment Evaluation. New York: 2012. Poole Jr, Robert W., and Ted Balaker. 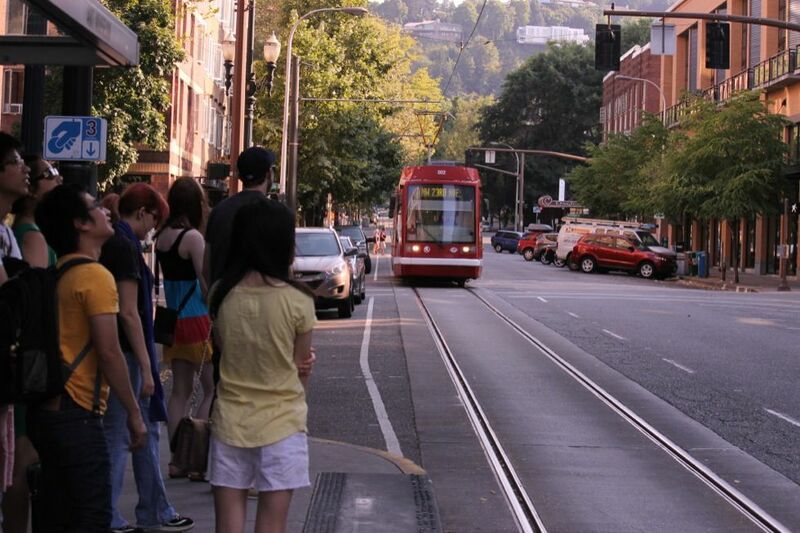 “Virtual Exclusive Busways: Improving Urban Transit While Relieving Congestion.” Reason Foundation, 2005. Todd, Michael, Matthew Barth, Michael Eichler, Carlos Danganzo, and Susan A. Shaheen. "Enhanced Transit Strategies: Bus Lanes with Intermittent Priority and ITS Technology Architectures for TOD Enhancement." Berkeley: California PATH Program, Institute of Transportation Studies, University of California, Berkeley, 2006. VTA Transit. “BRT: Bus Rapid Transit Service Design Guidelines.” Sustainability Policy (2007): 1-101. 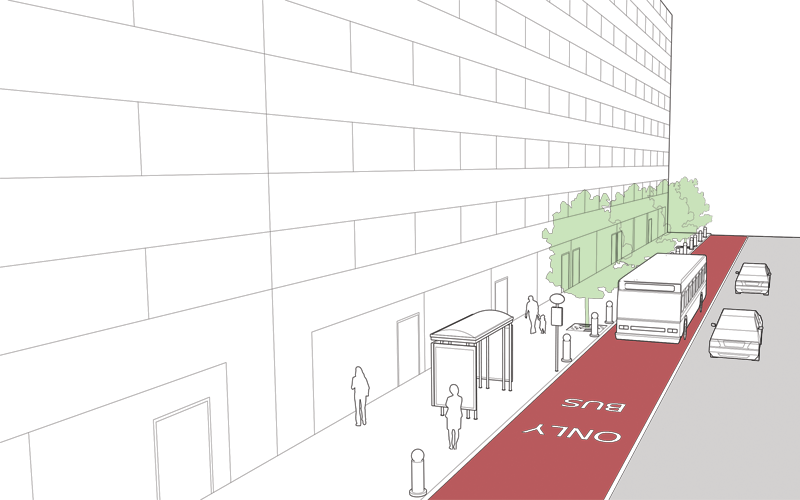 References for Dedicated Curbside/Offset Bus Lanes: 15 found.